So... did she or didn't she? 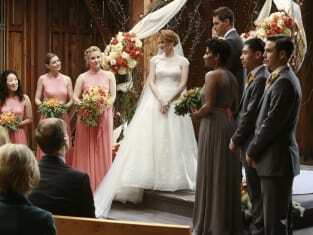 Did April actually exchange vows with Matthew on Grey's Anatomy Season 10 Episode 12? Did her wedding go off without a hitch and these two are now happily off on their honeymoon? We won't give anything away here, except to say: come on. This is Grey's Anatomy. This is Shonda Rhimes. How likely is it that no unexpected drama played a role in the big event? Elsewhere, Derek received a major call from a rather important individual, while Meredith and Cristina continued to fight. Big time.